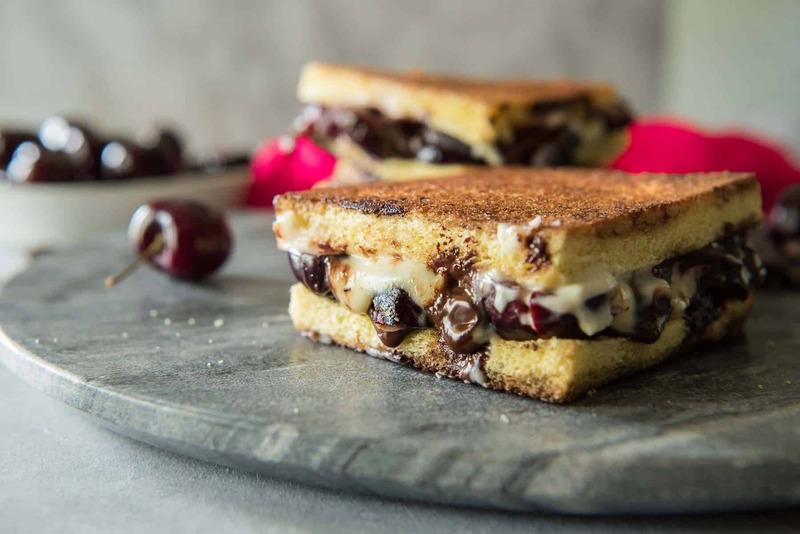 Prepare to appreciate sandwiches in a whole new way with this Dark Chocolate Cherry Dessert Grilled Cheese! 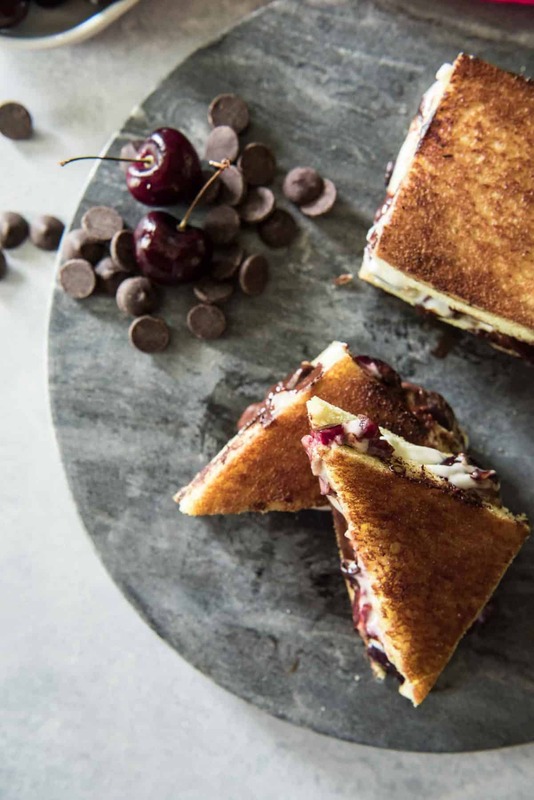 Fresh bing cherries, sweetened Mascarpone, and luscious dark chocolate melted on brioche make this a sandwich destined for your dessert menu! If this thing doesn’t taste like a summer-fall baby, I don’t know what does. I don’t mean an actual baby. 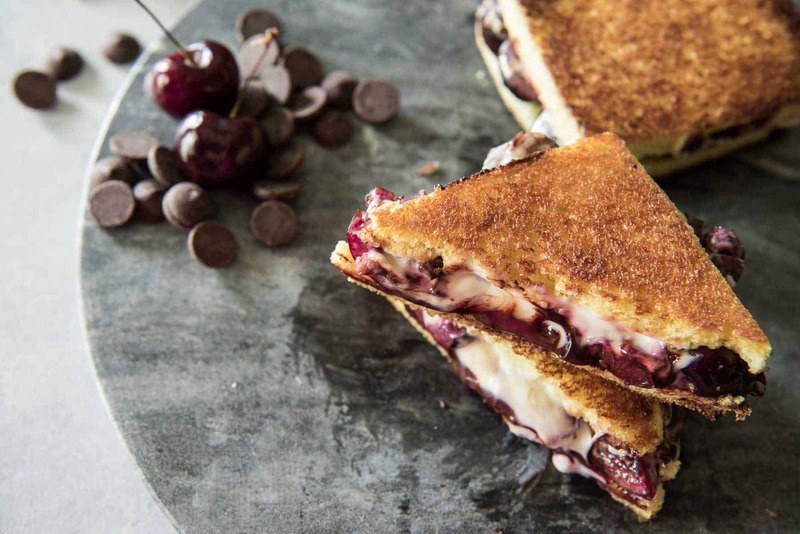 But, like, if summer cherries married dark chocolate, and they somehow had a baby, it would be this dessert grilled cheese sandwich. Seriously, how are these not more popular? I’ve been on a serious cherry, peach, and watermelon kick this summer. I blame the farmer’s market – they draw me in with their super cheap sale prices, and then I can’t get out of there without spending $40 on all the produce. I’ve picked up everything from giant poblano peppers to cute little lychee pods, farm-fresh Amish chicken eggs to the prettiest head of purple cabbage I’ve ever seen. I’m starting to think I need to come up with a recipe plan for everything before I buy it, though. I’ve found myself staring at my weekly hauls in disbelief, trying to figure out how I’ll use it all before it goes bad. I’ve been finding all these strange fruits, but still can’t find either white OR pink dragonfruit. You have no idea how badly I’ve been craving some – I blame Instagram. All those jerks and their pretty smoothie bowls and fruit platters with their fresh dragonfruit. If someone express mailed me some, it would make my life. Tropical as coastal Florida is, we are clearly not on the same summer fruit wavelength as the rest of this equatorial region. I digress. Cherries, however, have been in my house since the first day I laid eyes on them in the grocery store. I hoard cherries. HOARD THEM. 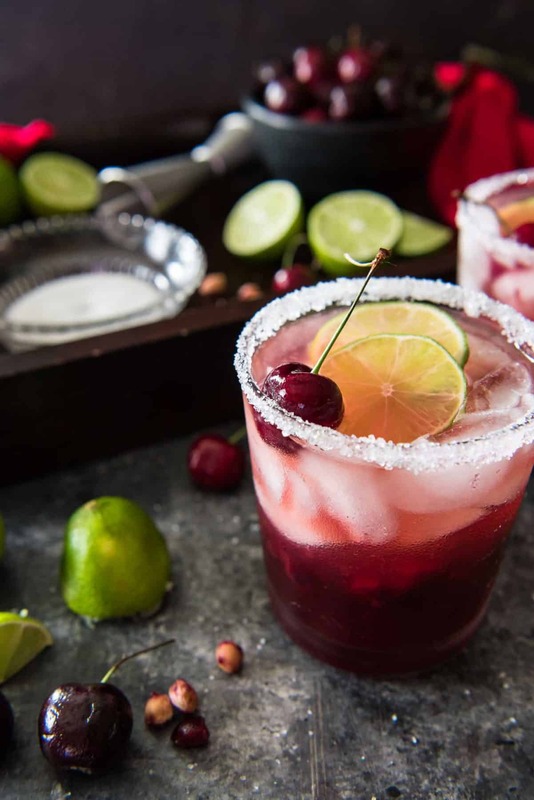 Their season is so blissful and yet, so short, so the Hubs and I have been enjoying them to the fullest – he and his Rainiers, and me with my Bings. (We also differ on grape preferences, in case you were curious. Probably not.) I stock up, pit them, and freeze them when they’re 99 cents a bag, too. I’ve been using these summer gems in everything. 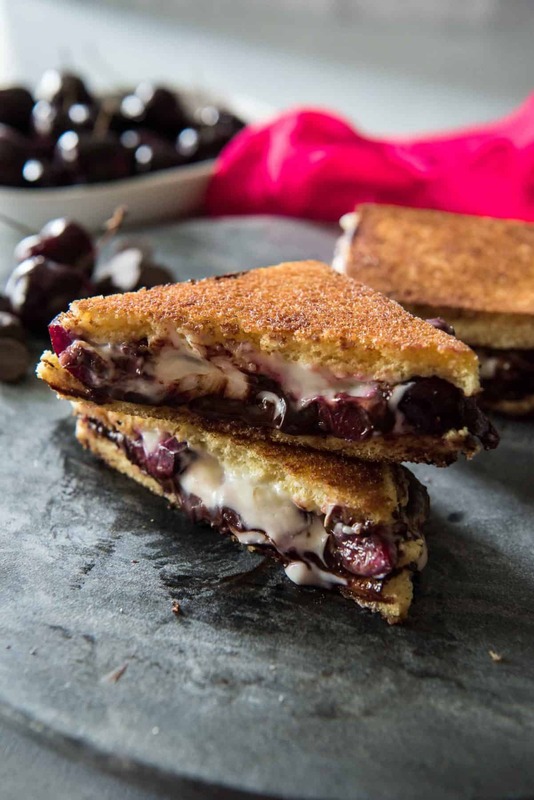 Cocktails, smoothies, salads (one coming at you next week,) desserts, a pie (you may as well call next week #CherryWeek,) and this here fun little dessert grilled cheese sandwich right here. Gotta get in all the cherry love while we still can. Simple. Tasty. Confusing, since it’s a sandwich plus a dessert. Combine mascarpone, sugar and vanilla in a small bowl. 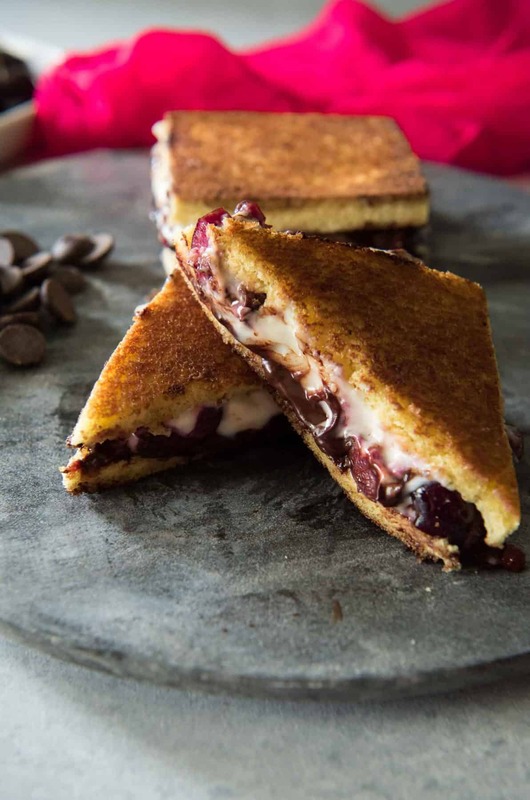 Spread mascarpone mixture evenly between two slices of brioche. 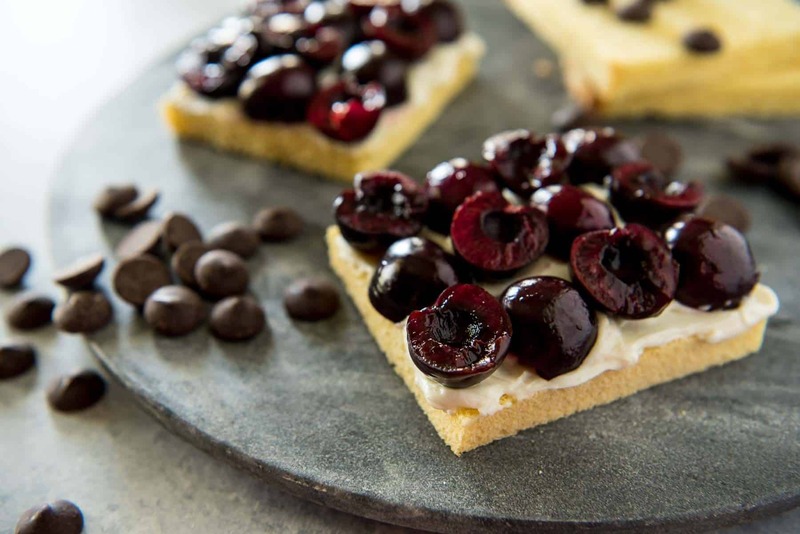 Top each with a single layer of halved cherries, then sprinkle chocolate between. 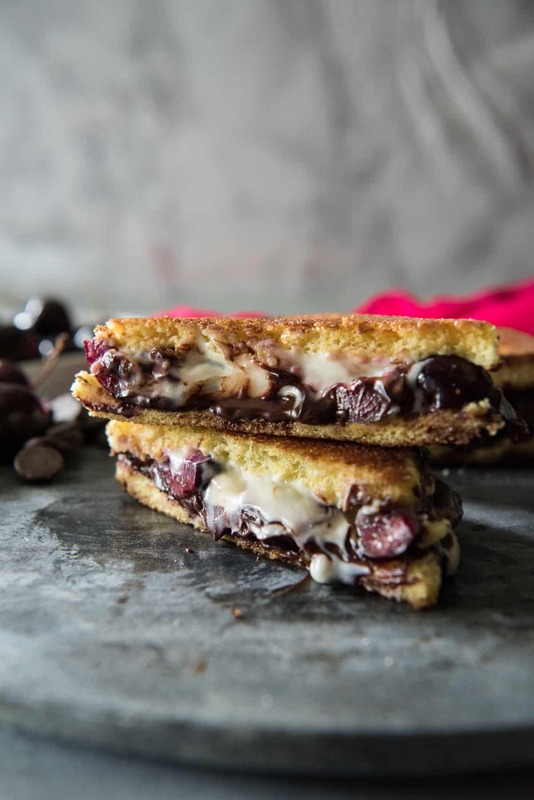 Spread half of the butter on one side of the other two slices of bread, then place on top of the cherries with the buttered side up, pressing down firmly. Heat remaining butter in a large nonstick skillet over medium-high until melted. Add sandwiches, buttered side up, and cook 2-3 minutes on each side until chocolate is melted and bread is browned. Serve immediately. Looking for more sandwich recipes? 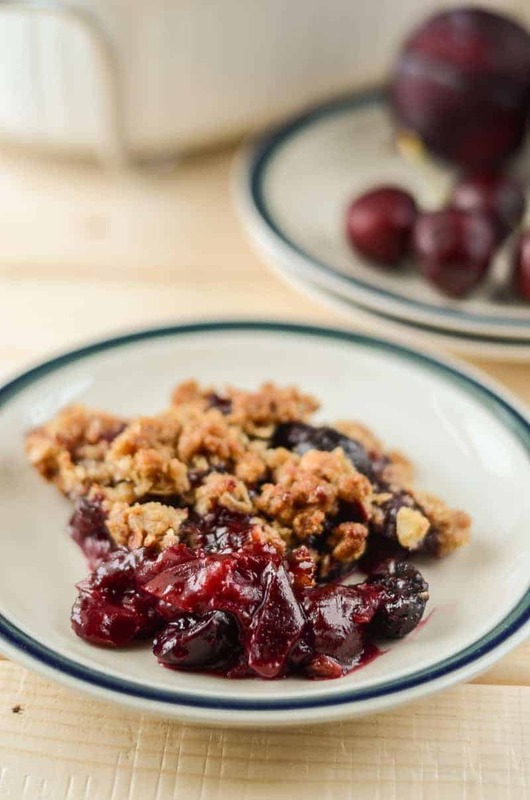 How about a couple more treats made with fresh cherries? Wow! 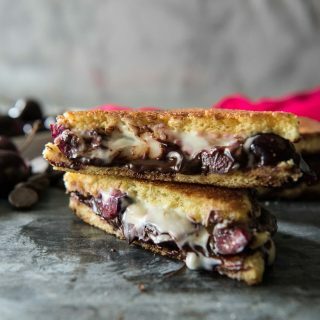 I love this dessert sandwich, so creative!!! 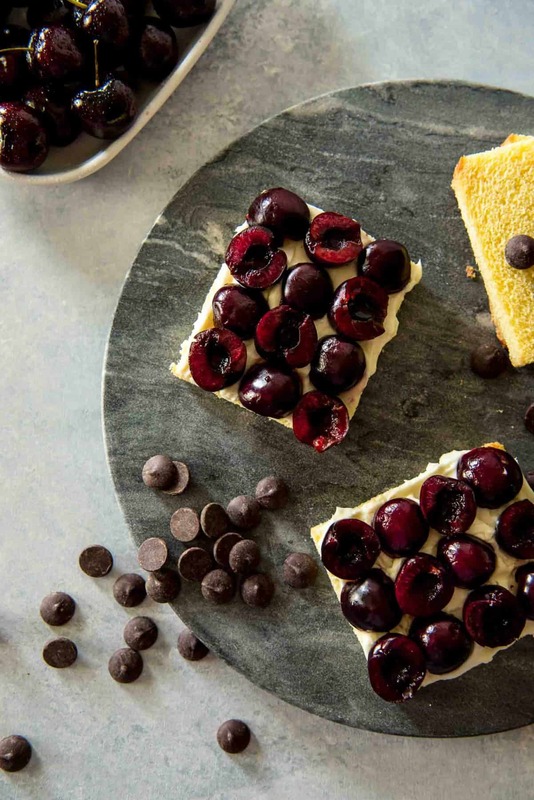 Mascarpone, cherries and chocolate??? SIgn me up for one of these babies!! Wow!! This is so gorgeous! I cannot wait to give this combo a try!